In recent years Egypt’s people have suffered the devastation of a crumbling tourism industry – Ancient wonders, Mediterranean and Red Sea coastlines, post card scenery and thousands of years of food and culture remain. The tourists have not. Failed revolutions and unfortunate airline disasters have given Egypt a largely unwarranted reputation for danger. Infrastructure once used to transport and accommodate tens of thousands of tourists each day, now service just a few hundred. Those who arrive at the famous temples and archaeological sites, find them eerily empty. As a result entire communities built on tourism now struggle to survive. Egypt and its people are hurting. For those willing to look past the reputation of recent years, there’s never been a better time to cross off your Egypt bucket list; you will be helping a vital national industry recover. For all the current despair in the country, there exists a small town that is both safe and resilient. 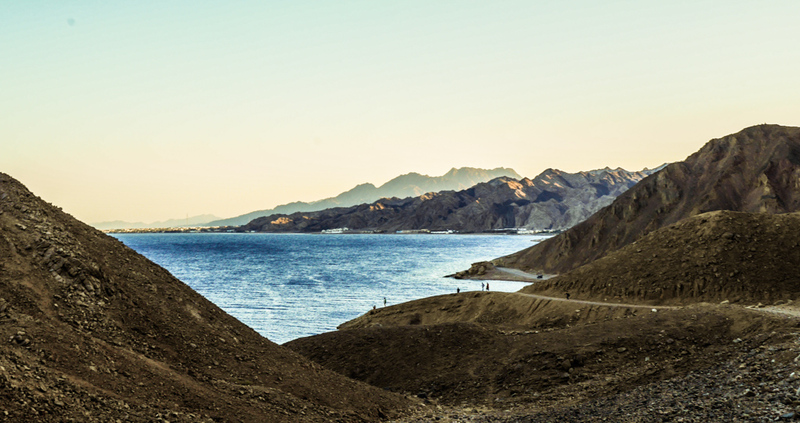 Lying in the foothills of the twisting, multi-coloured Sinai mountain range, Dahab, serves as a pier to the northern tip of the Red Sea. 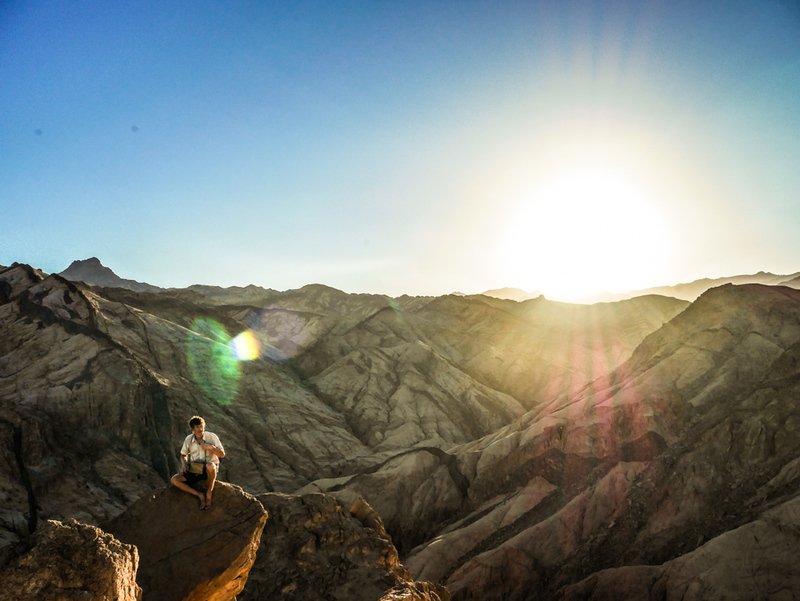 Offering such a wide range of heart stopping activities it might just be the adventure capital of the Middle East, certainly Egypt. Mountain climbing, wind surfing, desert trekking, camping, snorkelling, freediving, scuba diving, camel diving safaris, are what one could expect from a visit. The choice is actually a little overwhelming, thankfully I had my hosts Desert Divers Dahab to ensure I wouldn’t miss anything this town had to offer. 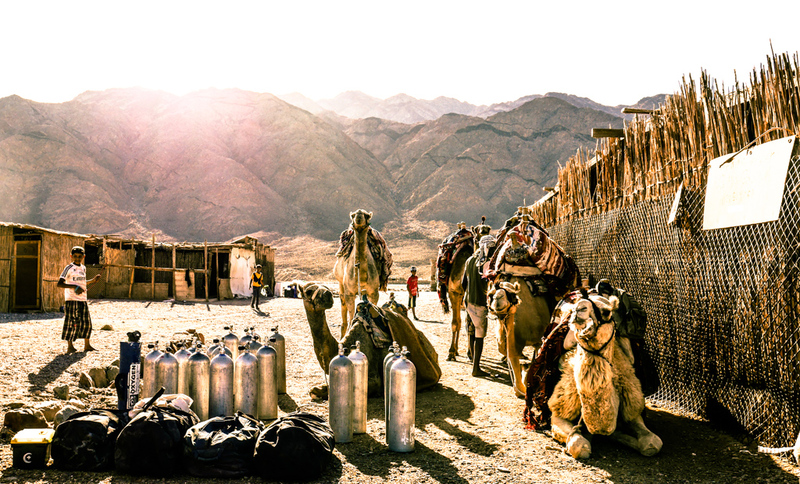 Desert Divers’ is as part of the Bedouin community, running out of Marine Garden Camp, on the shore of the Red Sea. Husband and wife duo Said and Tanis coordinate everything from diving and climbing courses to full, multi-day treks through the desert. My first few days were spent discovering the terrifying art of freediving, while my friend was, for the first and 19 times after, able to experience life under the sea with scuba. 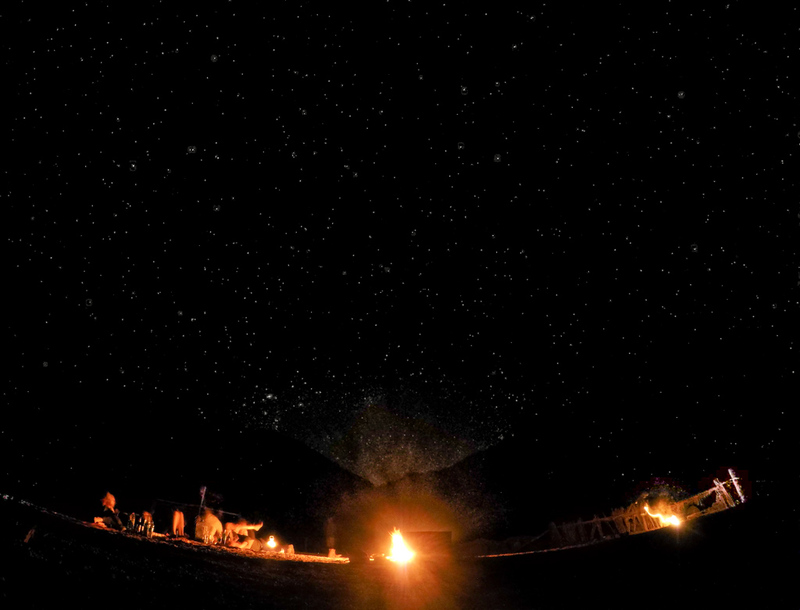 We spent one afternoon trekking through the desert, camping under the starry Sinai sky. We feasted on fresh cooked Bedouin style fish over a fire and drank wine from mugs. 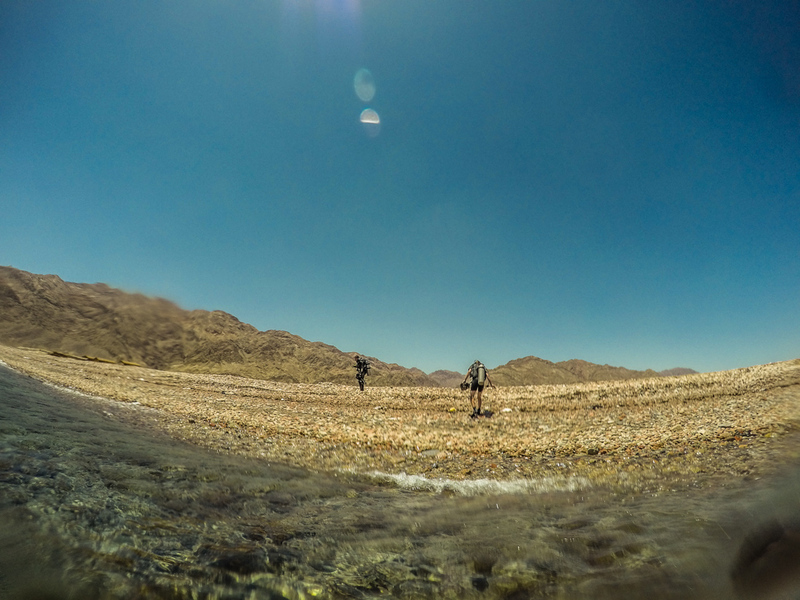 We swam, snorkeled, hiked, and relaxed – every day was magic against the backdrop of Dahab’s sleepy beaches. 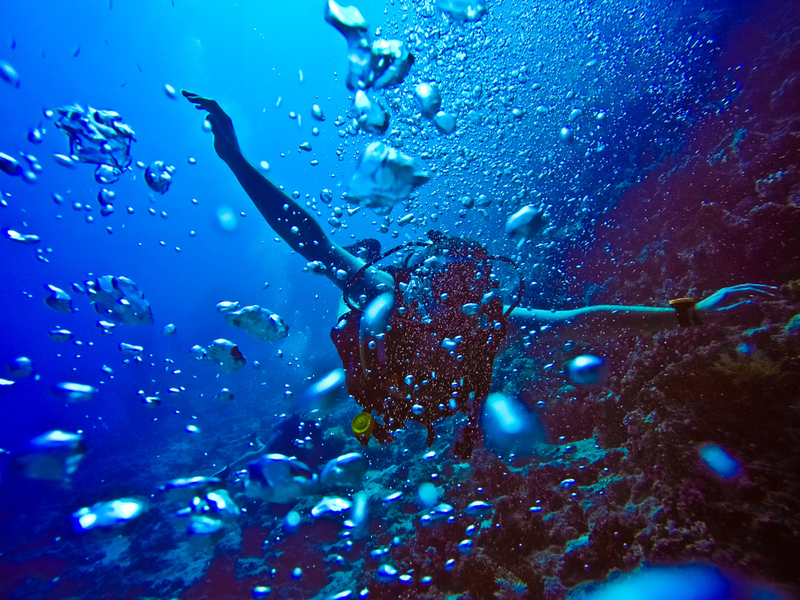 However, by far the most exciting adventure to be had in Dahab waits some distance outside of town. 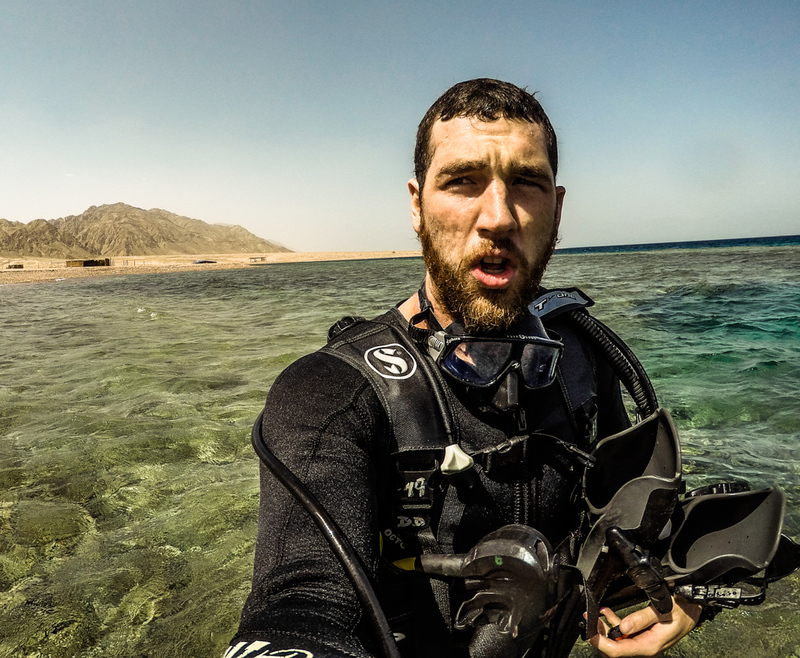 Said was the first Bedouin dive instructor in Dahab. Growing up in the mountains as his home slowly became a world renown dive spot, gave him unique insights more traditional divers lacked. He came up with the idea of camel diving safaris and it remains one of the greatest adventures I’ve ever had. 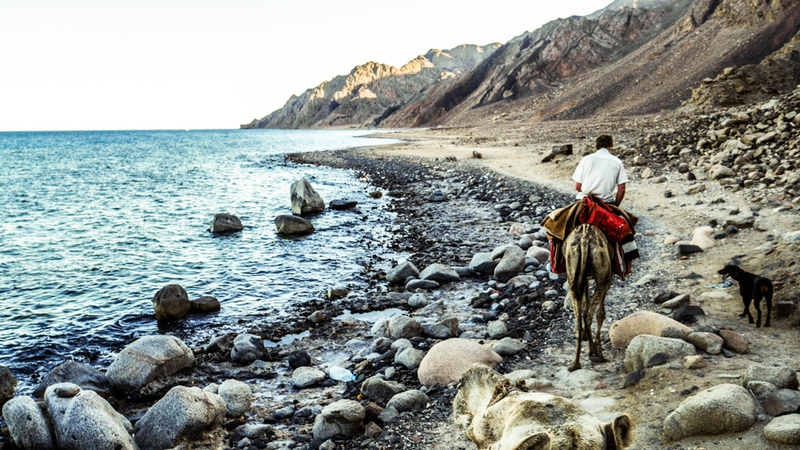 Picture a camel trek over sea worn rock, between the Red Sea and Sinai Mountain Range, taking you to the remotest parts of the coastline, along with all your dive gear. The destination for our safari was a Bedouin camp in Abu Galum. Completely surrounded by mountains, the only way to reach it was either by boat or camel. The boat was first. We arrived at our camp – a collection of three walled shacks facing the sea – around mid-morning. The desolate land in front of us, haunting in its beauty was cut into four distinct colours of azure, raw umber, grey and dark blue. Each colour separated the sky, mountains, desert and sea on the horizon. We wasted almost no time – within half an hour we geared up and walked a small way to the sea, the cool water welcoming us to an ever-expanding garden of colour. If Abu Galum felt otherworldly before, emerging from the ocean I had to almost slap myself to shake the surreal feeling of isolation and desolation that overwhelmed me. My friend and I later talked about leaving the water – breathing from our regulators as if they were space suits. 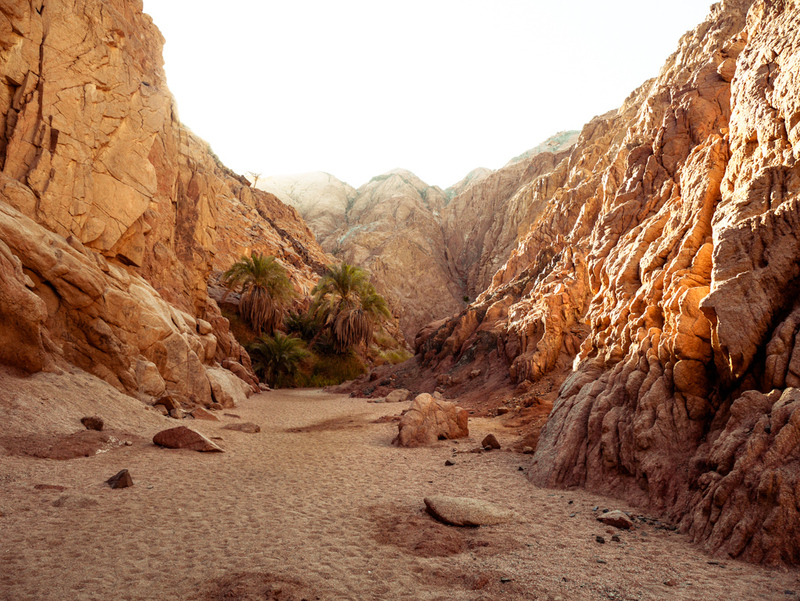 Climbing Abu Galam’s beaches felt like the discovery of another planet. Each subsequent trip to the sea, another expedition. Life was simple, consisting of nothing more than diving explorations, resting, tea drinking and feasting. After a full day of diving and not much else, the night was spent under the stars enjoying another Bedouin feast of reef fish. I’ve never felt more relaxed in my entire life, there was nothing to concern myself with other than the planet around me. After diving in the morning and a final lunch, we packed the camels for the trip back along the rocky coastline to Desert Divers’ and the Marine Garden camp. 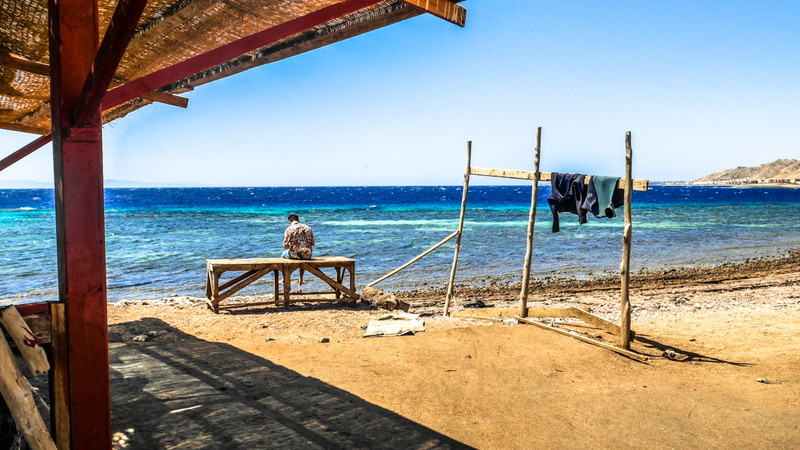 There’s not a person in Egypt not feeling the strain on its economy, but Dahab has kept its charm, its soul, and enough visitors to persevere. 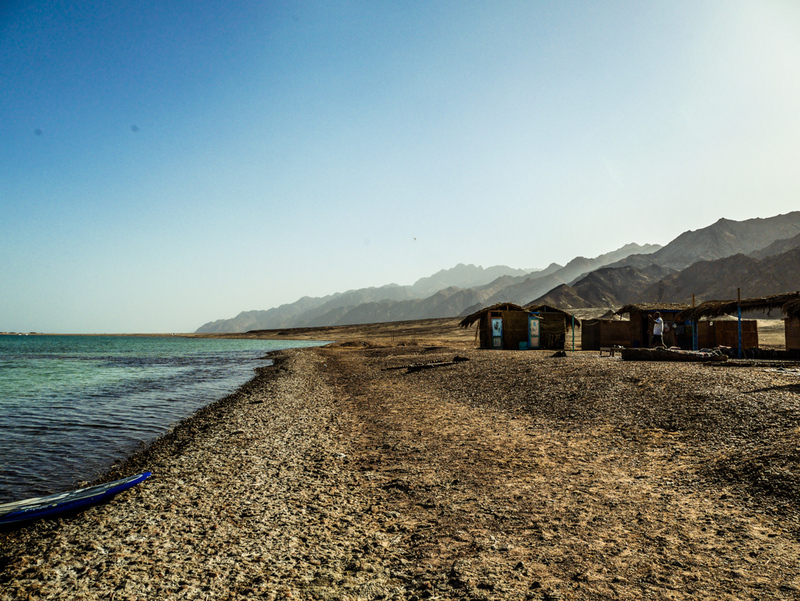 The strong ties with the local communities, focus on sustainable tourism, and high concentration of small business – as opposed to enormous hotel chains -have made Dahab adaptable enough to endure, even prosper during these tough times. Yet they still need travellers willing to experience all that it and Egypt have to offer. It is a truly rare thing that simply being in a place that offers so much, can in turn contribute so powerfully to its survival. I personally believe Egypt is safe, and now is the time to see it. The most incredible history on our planet, no crowds, no lines, and prices lower than ever. Go and see the Pyramids, the temples, and the Red Sea. They are still there, and more importantly, so are the communities that desperately need the business. Just also make sure to add Dahab to the list.